merchandising; new business ventures; and a music label. The record industry is known for chewing musicians up and spitting them out. Apparently Jay-Z didn’t get the memo. In the last 20 years, Jay-Z (a.k.a. 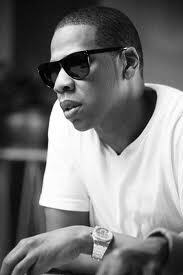 Shawn Carter) has amassed a personal worth of $450 million while turning the music business on its head. Sure, he’s had hit records and sold out shows – but the real wealth comes from his businesses (Roca wear and Roc-A-Fella Records). Keep reading to find out how Jay-Z became not just one of the greatest rappers of all time, but one of the greatest entrepreneurs of the 21st century. Jay-Z was born Shawn Corey Carter in 1969. He grew up in Marcy, a housing project in Brooklyn, New York City. In 1982, Jay-Z’s father left and his mother had to support her family alone. It was by following her example that Jay-Z got his unrelenting work ethic – his hustle. There wasn’t a lot of opportunity for ambitious Marcy kids like Shawn. Given the choice between applying for a job at McDonald’s or becoming a drug dealer, he chose the latter. In Brooklyn, that was the definition of a hustler: somebody who hit the streets to sell drugs. But Jay-Z fit another definition of the word hustler: an energetic go-getter. Even as he continued to work as a dealer, Jay-Z never lifted his eyes from the goal of becoming a great rapper. He and his friend Jaz would lock themselves in a room for hours on end, just working on their technique. It’s that type of hustle that allowed Jay-Z to develop into one of the greatest rappers of all time. Now Jay-Z runs legitimate businesses instead of selling illegal drugs, but he’s still got the energy of hustler. More than anything else, that has been the engine behind his success. Jay-Z didn’t have a drum kit or Pro Tools growing up, but that didn’t stop him from making beats to rap over (he used his fist and a kitchen table). Likewise, when Jay-Z first started Rock-A-Fella records the company office didn’t have desks, computers, or air-conditioning, but the company still put out hit records and turned a profit. If you want something badly enough, you can make it happen. Don’t let imperfect circumstances prevent you from executing your goals. Young Jay-Z’s pounding on the kitchen table annoyed his siblings, but his mom saw something else: a budding passion in her son. She bought her son a boom box for his birthday so that he could continue to grow as a rapper. If Jay-Z hadn’t shown his drive to improve as a rapper, then his mother never would have splurged on a boom box. Since he did, he received a powerful new gift on his artistic journey. When people see that you are pursuing a goal, they’ll want to help. But don’t expect any gifts from others until you’re doing everything you can to help yourself. Whether you’re a writer or an entrepreneur, you never know when inspiration will strike. Make sure you have a way to write it down or record it so you won’t forget. Jay-Z was still struggling to break through into the music business when his collaborator, Jaz, got a big record deal from EMI. Jaz was going to London to record and he wanted Jay-Z to come along. When Jay-Z told his crew about it, their response was less than enthusiastic. They felt like they were being deserted and told him that rappers were just being used by the music industry. It’s tempting to share your dreams and goals with people, but be careful not to talk too much. Sometimes even your closest friends and family members won’t be able to see your vision and their response will be discouraging. Actions speak louder than words. Jay-Z never went to business school. But that hasn’t stopped him founding $100 million companies and serving as a co-brand director for Budweiser Select. While others were out getting their MBA, Jay-Z was learning real-life business skills on the streets. He learned sales, management, and promotion on the streets, so it’s no surprise that he slipped comfortably into the many roles of an entrepreneur. We all have a breadth of experience to draw from. Always keep a look out for how your skills in one field can be used in another. Jay-Z was offered a weak endorsement deal from Iceberg Apparel, even though Jay’s shout-outs for the clothing company were boosting their sales through the roof. So did he accept their offer? No. He started a competing clothing line and sold it ten years later for $200 million. Sometimes we think we know how it’s all going to play out in our head, but there’s something powerful and clarifying about actually writing things out. If you haven’t already put together a short business plan, do it today. You don’t have to follow it exactly (in fact, you probably shouldn’t) but having made a plan and wrote it down is invaluable. It’s a common story in the entertainment industry: an up-and-coming artist gets a little taste of success and then everything comes crashing down when they get caught up in the lifestyle (i.e. parties, drugs, and alcohol). The same thing happens to entrepreneurs. Letting a little bit of success coax you into laziness or over-indulgence is an easy way to run your fledgling business into the ground. It’s this ability to resist temptation that has allowed Jay-Z to turn his initial success into a business empire that will likely be around long after he’s gone. As a poor kid growing up in a housing project, nobody ever told Jay-Z he could one day be worth $450 million or that he would pack Madison Square Garden. But he did have a sixth-grade teacher named Miss Lowden who “must have seen something” in young Shawn Carter. That little show of support gave Jay-Z the confidence to imagine a life beyond the projects. Accomplishing enormous goals starts with the ability to imagine them and the willingness to pursue them. There’s a good reason people think of art and business as mortal enemies. When money starts to influence creative decisions, the art suffers. But Jay-Z’s proven that art and business can actually benefit one another when combined carefully. But he was nowhere to be found at the ceremony that night. Jay-Z had boycotted the Grammys because he “didn’t think they gave the rightful respect to hip-hop.” So even though attending the event would have been good for Jay’s career, he passed it by. It wasn’t the first time Jay-Z made such a stand. Jay-Z clearly has zero tolerance for disrespect – and as a result he’s very rarely disrespected. Entrepreneurs and artists tend to be strong-minded individuals. Jay-Z is both, but that hasn’t stopped him from seeking the guidance of a host of mentors through the years. A good mentor has already been in your position. That means they can see what steps you need to take and what mistakes you must avoid – all while still giving you room to breathe and grow on your own. If you don’t yet have a mentor on your entrepreneurial journey, get one. Without the role models below, Jay-Z couldn’t have become the entrepreneur, rapper, and championship-caliber performer that he is today. In 2009, the hot trend in hip-hop was auto-tune. T-Pain was scoring hit after hit with perfectly-pitched, synthetic vocals (see Flo Rida’s “Low”). But Jay-Z didn’t jump on the bandwagon. In fact, his big single that year was called “D.O.A. (Death of Auto-Tune).” The song was everything auto-tune wasn’t: dissonant, noisy, and off-pitch. Following the latest fad isn’t a good strategy for long-term success. You can make a more powerful statement by marching to the beat of your own drum, even if that means standing apart from the crowd. In April 2011, Jay-Z dove into a new industry: blogging. His site, Life + Times features articles on whatever’s on Jay’s mind: music, sports, technology, and fashion. It’s worth checking out just for its sleek, tile-based design. Why would a rap mogul worth $450 million start a blog? Jay realized that blogging was more than just another way to speak his mind. Publishing content online allows him to expand his influence and grow a loyal audience – which will ultimately be good for his bottom line. Jay-Z’s success has allowed him to help the world in ways that would never have been possible if he hadn’t become an entrepreneur. Along with P Diddy, Jay-Z donated one million dollars to aid the people of New Orleans after Hurricane Katrina struck in 2005. After meeting with United Nations Secretary General Kofi Annan in 2006, Jay-Z pledged to help promote awareness of the global water shortage on his upcoming world tour. If Jay-Z had stayed selling drugs, he would have kept making good money (though he likely would have been caught before long). But he never would have been able to make the positive impact on the world that he has an artist and entrepreneur. The reason Jay-Z is so much wealthier than other entertainers is because he’s more than just an entertainer: he’s an empire. He has owned night clubs, record labels, clothing lines, restaurants, and he’s currently part-owner of the New Jersey Nets. Jay-Z is his business, he’s selling his lifestyle – and we’re buying. Thus education is a path that brings about being enlightened to a person. A human being is born into this world as an infant who grows up to become an adult. This is to say that at every stage of growth and existence there is a learning phase. Do you agree with me? As an infant you learn, or to put it in another way, you are educated (enlightened) about what it takes to crawl and how to crawl and then at another stage how to walk before the infant becomes a fully grown adult that is capable of experiencing learning and adaptation on their own. Dedication in education entails having the right mental and physical attitude toward achieving a particular goal. For an infant the goal can be to crawl at one stage and walk at another. But if an infant sits down without making an attempt towards these goals. The goals become deficiencies in achievement of the person. Education in the society we live in today assists in setting out standards and goals which people use to attain and achieve their goals in various fields on study and life also. Looking at the definition of education from the abbreviation meanings, I see it as a concept which must be understood and then applied in the proper manner to achieve and yield any positive result. Education is therefore not just going to school to study but also a concept that applies to all perspectives and areas of life. The meaning of a word can be understand in different ways by people but there is always a standard definition and meaning attached to a word and its purpose is clearly stated. Going through school is a standard that has been set to enable the society ascertain the ability of a person by means of Mass examination I call it. And education is applied broader than the class room. So u don’t have to dislike education but be attentive about learning about it since it applies to our existence in all areas. Even a successful person becomes a success be getting acquainted with being enlightened and dedicated to understanding what it takes to achieve success in any specific area and achieve a goal. Thus you have to educate yourself to become successful too. In pursuance of a specific goal education helps you to become an enlightened, dedication, understanding, courageous ( ability to take risk), action oriented person about a particular goal. In the end you become educated about what you have achieved. Right? Everyone gets educated about all things in life, be it positive or negative. This illustrated that education fits into our lives and plays an important role, which means that for a person to perform in a specific area of life, a level of education must have being attained about the specific area of interest. Going to school is different from education and being educated.